We saw a lot of turnover amongst the top of the boys NCISAA 3A last year in the top 4 finishers headlined by three time Individual XC Champion Coleman Mitchell. This year the as the larger NCISAA classification changed from 3A up to 4A the classification is looking to crown a new king as a new era unfolds. Andrew Hammel (Christ School) was the top returner from last year with a 5th place finish in his sophomore year. The junior had an injury for the track season, but bounced back really strong this season running a seasons best of 15:46. 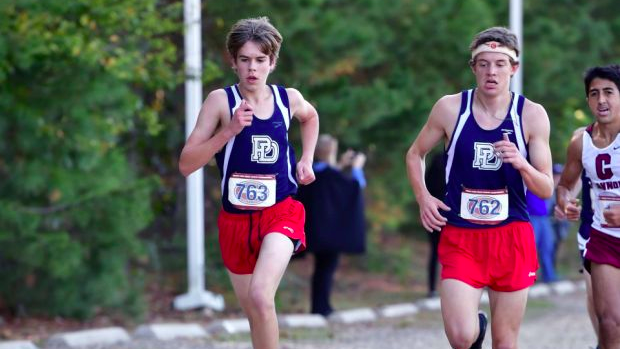 His competition is going to be Christian Landis (Providence Day) who took 6th last year as a freshman in 16:07. Landis had phenomenal freshman campaign on the track clocking 4:28 for the 1600m and was the New Balance Outdoor Nationals Freshman 2 Mile Champion with a PR of 9:38. Landis broke out at the Great American XC Festival a few weeks ago running a NC#3 mark of 15:25. The sophomore is just 5 seconds back of the state lead and very well could be the top boy in the state as the season comes to a close in the coming weeks. These boys look to be the stars of the 4A classification and will battle it out as each seek their first NCISAA State Title. It seems coming into the race that there will be a gap beyond Hammel and Landis in a battle for third. We've seen a breakout junior year from Joseph Visconti (Christ School) who was 47th in this event last year running 17:48 at the state meet. He enters the weekend ranked 3rd in our virtual meet with a 16:13 seasons best. Neil Mosca (Durham Academy) returned this season with a PR of 16:09 and ran his seasons best at the TISAC Championships last weekend of 16:23. Last year he was 7th at the state championships and 11th a year prior. We saw strong performances out of Cary Academy's Luke Johnson and Kenny Eheman last weekend as they ran PRs of 16:15 and 16:20 at the TISAC Championship finishing ahead of Mosca. The two will look to cap off strong seasons with a top 5 finish tomorrow. We have a slew of Providence Day athletes that should be battling up front in Adam Habas, Jason Krell and Colter Nichols. They all enter in the top 11 of our virtual meet with Habas holding the best mark on the season of 16:16. Nichols has been a big bright spot for the Chargers this year running 16:27. Krell has battled some minor injuries throughout the season and has run a best of 16:30. After a big sophomore year on the track Krell proved he's capable of being up front in this race with Landis and Hammel if the fitness and health is there. Team wise Providence Day is going to be a problem for the rest of the NCISAA 4A. On a perfect day they could have five boys in all-state (Top 11) contention with Andrew Riolo in addition to Landis, Habas, Krell and Nichols. After winning the team title in 3A a year ago this team only lost one senior in Noah Dolhare and have no seniors in their current top 9. They certainly enter the team as heavy favorites with their 16:17 average on the season. Durham Academy will be their biggest competition with a 16:39 team average. The Cavaliers have a strong pack of 5 athletes that have a 1-5 split of 27.40 on the year and are coming off a TISAC Conference win over rival Cary Academy. Durham Academy senior will need senior Neil Mosca to lead this pack to have their fifth finish ahead of Providence Day's if they want a chance at an upset on Friday. Cary Academy will fight with Durham Academy for a spot on the podium, and typically perform a lot stronger at the State Championships then they have at their conference meet. They'll be lead by Luke Johnson and Kenny Eheman up front and will look for a strong day from their 4/5 to compete with Durham Acadmey and Providence Day. Their 3 to 4 gap on the season is 48 seconds but they have a strong group of guys from 4 to 7. They'll need a big day from two of them Friday in order to secure a top 2 team finish. The girls field looks to be a strong battle up front between Stella Stringer (Durham Academy), Brooke Robinson (NRCA) and Sophie Spada (Charlotte Country Day). Stringer will be the top returner in this field after a 3rd place finish last year just ahead of Sedona Dancu (Covenant Day). Stringer and Robinson battled it out last week at the TISAC Championships posting the top two NCISAA 4A performances on the year in 18:44 and 18:49. Stringer is just a freshman while Robinson is a junior. Though it might look like they're the two frontrunners in the virtual meet, junior Sophie Spada (Charlotte Country Day) will be in the mix up front as well. She's run 19:14 this season and won the CISAA Championships by 20 seconds over Kelsey Troutman (Covenant Day). Spada took 6th place as a freshman and after missing a year due to injury she's back and eyeing the individual crown. 7th grader Allison Hall (Durham Academy) has run 19:12 this season and is certainly going to be a rising star in the NCISAA over the next five years. She enters the meet with the 3rd fastest time on the year and should be in contention up front despite being the youngest competitor in the field. Providence Day girls should have at least two girls up front with Justine Cronk and Ashley Horwitz. Cronk holds a 5K PR of 19:06, but has just run 19:30 this season. She was a contender for the individual crown last year and could be again Friday if things come together for her. Last year we saw a huge day from Covenant Day at the state meet to win on a tiebreaker against Cary Academy. They returned that whole team, but come into the meet ranked 5th in our virtual meet. They have two girls that'll be in the lead pack in Kelsey Troutman and Sedona Dancu who are both projected to be top 10 finishers. Durham Academy girls are unmatched through their top 3 girls as Stella Stringer, Allison Hall and Anna Catherine Wilson will all look for top 5 finishes this Friday. Their fourth girl Claire Middleton has been strong this year with a PR of 20:17, but they have had a gap back to their 5th through 7th girl this year. A big day from the teams 4th and 5th would look to shut the door on anyone else's team title chances. With a win this weekend Durham Academy will win their first NCISAA XC Team Title since 1996! Cary Academy looks to be their biggest competition after they scored their top 7 in before Durham Academy's 5th at the conference meet. On the big stage that'll certainly make the team battle a lot more interesting between the TISAC rivals. Cary Academy is lead by Keely Murphy and Thuc Dzu. These two girls will need to be in range of Durham Academy's top 3 tomorrow and the Chargers could reclaim the NCISAA title after losing on tiebreak a year ago. Charlotte Latin girls ran brilliantly at their conference meet posting an 11 second gap placing their top 5 6th through 10th to beat out Providence Day by 3 points. The two schools will be in contention this weekend for a podium spot on Friday. Latin will need to do the same at their conference meet, but their pack will need to be about 20 seconds faster than they were to contend with the top teams. Providence Day had their top 3 ahead of Latin's #1 at conference, but need to have a strong day from their 4th and 5th. They had an off day at conference, but that hasn't been the case for the Chargers most of the season. They'll need Cronk to serve as a low stick up front and then a good day from their 3 to 5 to land on the podium this weekend. Though this is now the NCISAA 4A it is pretty much put together by the last 22 years of NCISAA 3A. Those team and individual state champions can be found below.